AutoCAD Architecture - Z is for architects. Special features for architectural design and drafting, as well as the familiar working environment increase the efficiency of production projects and documentation. Also present in the assembly of modules for the design of stairs and User's Guide. AutoCAD Architecture - is AutoCAD for architects. Special features for architectural design and drafting, as well as the familiar working environment increase the efficiency of production projects and documentation. Two-dimensional sections and elevations are generated directly from the plans. When making changes to AutoCAD Architecture project updates sections and elevations. This saves the specified layers, colors, line types and other properties. You can do the drawings, and create documents using walls, doors and windows that mimic real architectural objects. Walls and their properties are edited at the component level, which allows to improve the work of the walls, with the most common characteristics - slanted, corners and intersecting fire-resistant walls. The program allows you to automatically insert and place doors and windows, controlling their location as accurately as possible. When you move the wall are automatically updated every junction to her other walls. It uses familiar commands AutoCAD, for example, "Pairing" and "bevel". For a more rapid formation of the documentation and explanation of causing the program offers an extensive library of detail components and powerful tools to work with key notes. With their help accelerate the creation of design elements such as labels, legends and links. The legend is placed on the drawing just a few mouse clicks. New User Interface AutoCAD Architecture - a product that is AutoCAD ® for architects - is characterized by an optimal organization, the greater area of ? ?the graphics area, as well as rapid access to tools and commands. Users have easy access to familiar tools that can more efficiently find frequently used commands, as well as easier to learn new functions. The improved interface is used in many products Autodesk, which allows you to spend a little time to study the transition to new applications. In AutoCAD Architecture wall and all their components are used AEC-dimensions. When applied to a variety of options are taken into account the size of the binding: the axial lines of the walls, their outer surfaces, etc. When changes in the project does not require manual updating associative dimensions, as They are converted automatically. Style specifications can easily adjust to the standards of enterprises. You can also create new styles of specifications that will provide the necessary data. These specifications are dynamically linked with the objects and drawings are updated when you change any element of design. Stamps premises and the area applied automatically. If you change the elements of the relevant areas bordering updated automatically. This feature saves time and ensures accuracy of documentation. Rooms can be created by the displacement of the neighboring cells based on standard or custom rules. Calculation of the area carried out in accordance with generally accepted standards such as BOMA, DIN, and SIS. Tools AutoCAD Architecture, designed to create redevelopment projects, allow designers to work with high performance. Stored, and new elements of the building to be demolished are allocated on the kinds of graphic way, all kinds of complete working drawings are coordinated with each other. 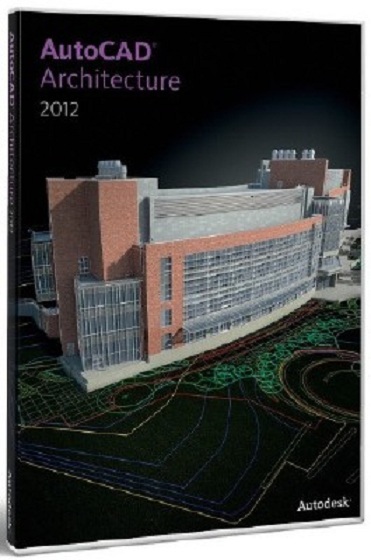 In AutoCAD Architecture 2012 improved the performance of many functions and tools, which designers apply daily. Download the software and reading blueprints are produced faster than before, accelerated and calling functions and navigation of large drawings. Thanks to this optimization work has become even more convenient. You can carry out simulations based on 3D-scans. This allows you to optimize the labor-intensive reconstruction and restoration. With support for up to 2 billion pixels, you can quickly visualize the surface of the scanned object and bind to it directly in the workspace for the simulation. In the new version you can display more pixels on the screen and select the form which they form. Improved well as API-programming interface. Create a corner window, it's even easier. The new version of AutoCAD Architecture makes it easy to place the window (with or without frames) at the corner intersection of two walls. Now you can change the custom grid columns and add new columns of the grid, based on previously entered data. At the interface of the product entered an option to add new columns along the axis of the grid. AutoCAD Architecture provides better performance in modeling and preparation of drawings. The new version of AutoCAD Architecture, you can import files to Autodesk ® Inventor ®; in this model are converted to 3D-blocks and form, together with the AEC-object associative arrays. Now, with multi-"pens" can be controlled by such entities AutoCAD ®, as lines, arcs, elliptical arcs, dimensions, Multileader, 3D-faces, edges and vertices. To access the options applicable to the selected object, it is necessary to hold the cursor on the "handle". AutoCAD Architecture 2012 allows you to quickly find the project files, architectural components and objects using the new panel. The search is performed in the current figures, the Web service Autodesk ® Seek ®, to local and network drives. AutoCAD Architecture 2012 drawings can be exported in a format Industry Foundation Classes (IFC). It facilitates the exchange of design information with other professionals. The Web service AutoCAD ® WS, which is accessible through a special add-in for AutoCAD ®, allows designers to share information over the Internet. View, edit and share DWG ™-files in web browsers and mobile devices. Russian User manual AutoCAD Architecture 2012, which includes a detailed overview and description of program features, images, help for the program. Many of you know how difficult and time-consuming process of designing stairs is a specific order. Design and calculation of the stairs has never been so easy. Plan for new stairs in your own individual requirements! Only a few parameters need to instantly get the results! Programs on the stairs Version 9 offers a wide selection of libraries of structural parts - a very important aspect when using the program for proektirvoaniya stairs. Thus there is a training project for production. Program Version 9 offers a conclusion dimensioned drawings, provides printing, working patterns on a scale of 1:1, as well as create programs for CNC lines. For more details, or broadly it is hardly possible. Sort orders for different types of objects, complex systems and individual stair ladder. All this - significant advantages Version 9. Review the structure allows for quick and easy access to all necessary information. Network database client-server-Bank, which gives an entirely new opportunities for the individual working groups. To edit the description of the drawings at your disposal a convenient document editor with which you can enter additional related information, such as - the sketch plan, three-dimensional images, drawings, details, etc. When you print settings are automatically determined by the program based on the settings of your computer and taking into account the requirements of your project. Automatically calculates the size of the drawing can be modified and supplemented. Length, distance, coordinates of points, radii, angles, text input. The different modes provide accurate identification of graphic elements. All structural parts are transferred to the module CAM (stud, sheathing, oblique vrubka, pazovanie for screws, dowels, miniship, pazovanie by hanging dowels, screws, stretch marks and much more). CAM is based on drawings created NC programs for CNC machines. NC programs quickly and without human intervention to manage processes. The user has quick and easy access to a variety of preset machines and treatments.